With QuickBooks, you can easily customize the invoice and credit memo templates, or create new invoices and credit memos based on one of the existing QuickBooks templates. All you have to do is open the form that you want to customize, click the Formatting tab, and then click the Customize Design button. 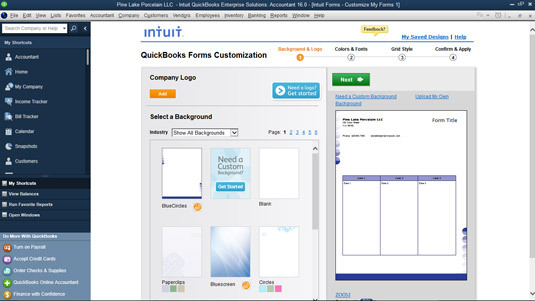 QuickBooks displays an Intuit web page that walks you through the steps to creating your own highly customized form. The QuickBooks Forms Customization web page. Alternatively, you can click the Formatting tab and then click its Customize Data Layout button. When QuickBooks asks if you’re okay working with a copy of the default form template, click the Make Copy button. QuickBooks then displays the Additional Customization dialog box, which provides a bunch of check boxes and text boxes you can use to customize away. 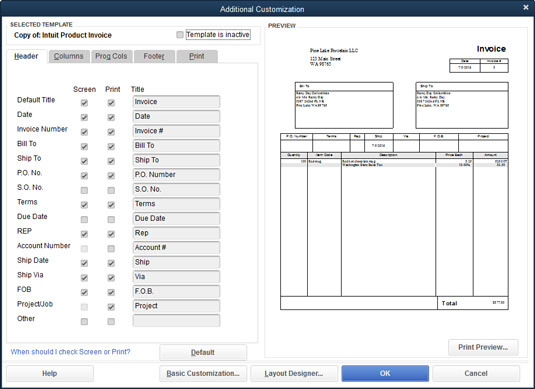 Use the Additional Customization dialog box to customize an invoice. If you’re creating a new invoice form by using the Additional Customization dialog box, you can also click its Layout Designer button at the bottom to open the Layout Designer window. In this window, you can become a true layout artist and observe how the overall look of your invoice changes when you move fields around the page with your mouse.